Congratulations to Freddie Draper who passed his viva on Friday with flying colours. Freddie’s thesis examined the modern and long-term ecology of Amazonian peatlands using a combination of permanent forest plots and pollen analysis of peat cores. 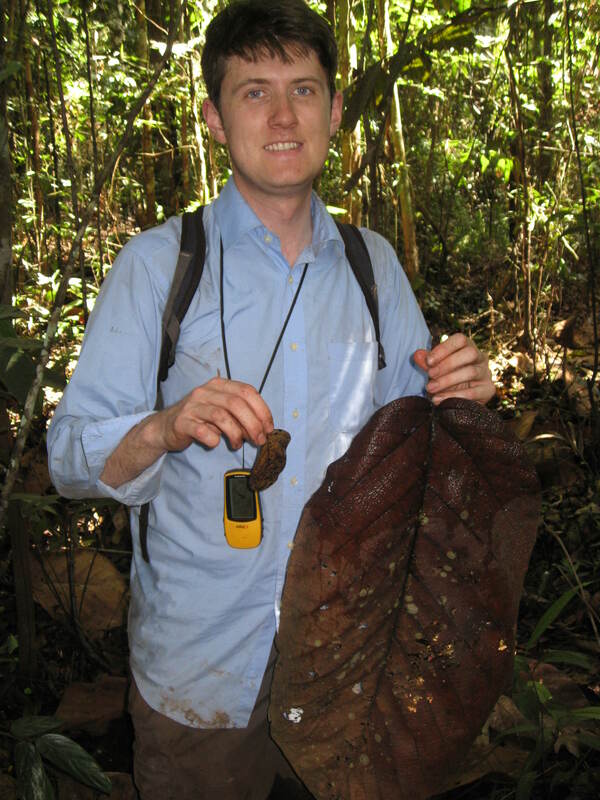 By increasing the number of peatlands measured and through combining different remote sensing products, his work has also led to a more refined estimate of the size and distribution of peatland carbon stocks in northeast Peru, following on from work conducted by Outi Lahteenoja at the University of Turku. Freddie published his study on carbon stocks in Peruvian peatlands last year, and it has already led to a $6 million investment from the Green Climate Fund which will support peatland conservation efforts. In recognition of this, Freddie was recently made postgraduate researcher of the year 2015. Since handing in his thesis Freddie has been back into the field (above) to help with a project led by Dr Sophie Fauset examining light levels in the Atlantic forests of Brazil. Freddie will also be heading back to Peru in January to work on Amazonian peatlands and their conservation with researchers at the Instituto de Investigaciones de la Amazonia Peruana, amongst others. Well done Freddie and good luck with your future exploits! 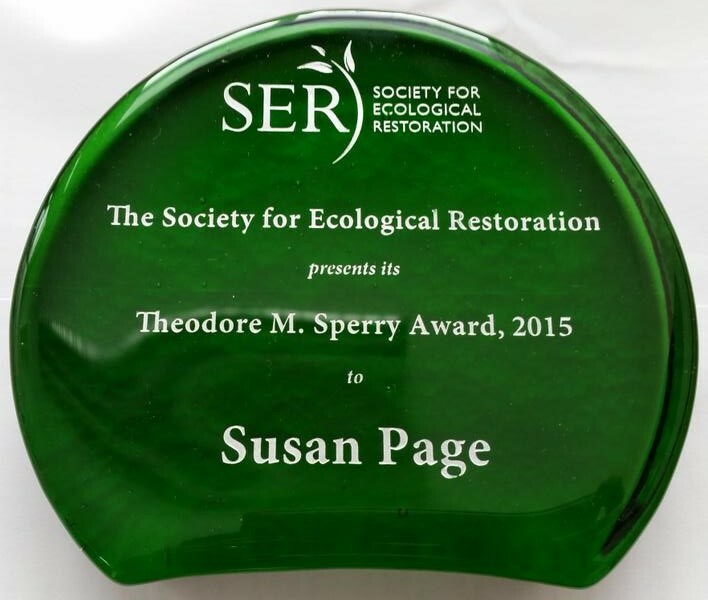 The UK-TPWG is proud to announce that Sue Page has been awarded the Theodore M. Sperry Award by the Society for Ecological Restoration. Established in 1994, the award is presented to “individuals that have made a significant contribution to the science and/or practice of ecological restoration.” Sue has been committed to studying and conserving tropical peatlands for many years, and we in the UK-TPWG are pleased that she has been honoured in this way. Well done Sue for all the hard work! European Conference of Tropical (partly peaty) Ecology coming up…. Time to register for the European Conference of Tropical Ecology (the annual meeting of the GTOE), this year to be held in Gottingen, Germany, from 23rd to 26th February 2016. Several of the group will be there, with Prof. Sue Page giving a key note talk and Dr Katy Roucoux chairing Session 14 (summary pasted below), which will showcase tropical peatlands. Abstracts should be submitted by 15th October, and there’s more info about registration, etc. here. Wetlands and peatlands cover large areas of the tropics, make an important contribution to regional biodiversity, host large below-ground carbon stores, provide valuable ecosystem services, and are a source of natural resources. Our knowledge of these complex ecosystems and their temporal dynamics remains far from complete. The aim of this session is to provide an interdisciplinary forum for researchers working on tropical wetlands and peatlands at a range of different timescales and using a range of different approaches. Ecological research on natural and anthropogenic processes in tropical ecosystems is often focused on present-day states, investigating a time interval in which species live under essentially unchanging ecological and climatic conditions. However, it is becoming increasingly apparent that a thorough understanding of present-day ecosystems requires a longer-term perspective. For example, the mechanisms responsible for current trajectories of change in forest community composition; the geographical variation of biodiversity; the process of plant community assembly; the role of ecohydrological self-organization in sustaining peat accumulation; and the extent of early anthropogenic impacts in the tropics, are all topics which would benefit from a fuller understanding of the historical development of ecosystems. A long-term perspective on topics such as the resilience of below-ground carbon storage is also vital if we are to contribute to predicting future scenarios of climatic and environmental change on regional and global scales. The session welcomes contributions from palaeoecology (typically millennial to centennial timescales), modern ecology (present-day and long-term monitoring), and ecosystem modelling (projections of future change), especially where an interdisciplinary approach is taken. Studies using innovative methodologies, for example for integrating spatial and temporal analyses through remote-sensing, will be particularly welcome. Although our primary focus is on wetlands, because lakes and peats provide excellent potential for palaeoecological research, contributions relating to the long-term dynamics of other tropical ecosystems will also be very welcome. Tom Kelly passed his PhD viva at the University of Leeds, with well-deserved commendations from his examiners Rob Marchant (University of York) and David Galbraith (Leeds). His supervisors (Ian Lawson, Katy Roucoux and Tim Baker) are very proud! Tom has already led or contributed to several papers through his research, and we look forward to seeing several more emerge over the next few months.